It’s often said that cats are nocturnal, but that’s not quite accurate. Cats are actually crepuscular, which means they are most active just before the sun rises and just after the sun sets. 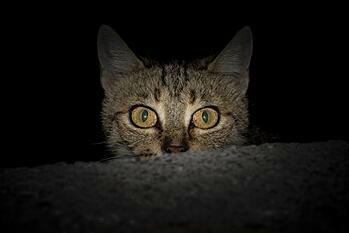 It’s natural to wonder where the heck cats go at night. At home, they’re usually sleeping, playing, cuddling, eating, or sleeping some more. But what do they do when they’re off on their own? Turns out, it’s quite a lot. Researchers at the University of Georgia placed small cameras on 55 cats in the Atlanta area and then studied more than 37 hours of footage to look for trends. Here are a few of the key takeaways. 44% of the cats hunted wildlife. Their main prey were reptiles, small mammals and invertebrates (things without internal skeletons… think spiders and slugs). Hunting cats captured an average of 2 prey during seven days of roaming. 85% of wildlife captures were witnessed during the warm season (March–November in the Southern U.S.). Younger cats caught more prey-per-hunt than older cats. Entering crawlspaces where they could become trapped (20%). If you’re curious about your cat’s wanderings or if you want to keep track to avoid losing them if they spend time outdoors, you might consider a GPS collar. In the video below, you can get an idea of what one cat did for about 12 hours during the day when its activity was tracked with a Pawtrack GPS collar. Even if an outdoor cat manages to steer clear of predators, they’re own hunting can be quite devastating on local wildlife. Researchers have found that as few as 25 cats in a national park can reduce the local bird population by half! That’s according to the National Park Service, which also notes that domestic cats can deplete the available food source for wild animals. Animals like coyotes, foxes, skunks, raccoons, and hawks have a harder time finding food in an area where domestic cats have already hunted the available supply. If that’s not concerning enough, the lack of available prey means an outdoor cat will become much more attractive to other large predators. There are two main reasons that lead to cat fights. As cats prowl neighborhoods and city streets, they will fight when there is competition for food or a mate. 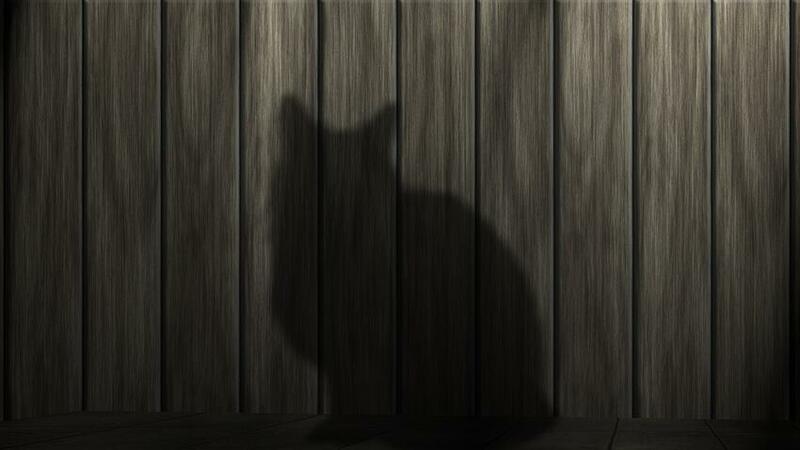 In many places, these encounters are more likely because cats’ territories are shrinking as neighborhoods become denser. According to Dr. Marci Koski, a certified Feline Behavior and Training Professional, studies have shown that cats' home ranges and territories are shrinking as the environment gets more crowded with cats — in other words, more cats in closer proximity equals more encounters and more fights as they compete over resources. And these chance encounters are more likely during the pre-dawn and post-twilight hours when cats are venturing out to hunt (remember how they’re crepuscular?). Unfortunately, cat fights can be quite vicious, resulting in scratches and cat-bite abscesses that can rack up vet bills of several hundred dollars to more than $1,000, and even spread diseases (see more on this below). A cat-bite abscess results in a soft swollen wound under the cat’s skin. It may be several days before you notice it. Worse still, cat-bite abscesses can pop and ooze the puss within. You might not notice a bite abscess until it begins to swell, but there are additional signs that might indicate a problem. While some cat bite abscesses may rupture and then heal on their own with some home care, these injuries are best dealt with by your veterinarian. In addition to bite abscesses, bite wounds are also the primary way of transmitting Feline Immunodeficiency Virus (FIV – a.k.a. “feline AIDS”), as well as Feline Leukemia (FeLV). Untreated fight wounds can easily become infected. A cat’s mouth carries as many bacteria as a dog’s, but their teeth are better suited to transmit those bacteria, even through minute puncture wounds, according to researchers with the Mayo Clinic. Cat claws also carry a ton of their own bacteria, which will fester and thrive in the warm moist environment of a fresh wound. In fact, cat scratch fever (the horribly painful disease for humans, not the horribly painful song) is caused by the Bartonella bacteria transferred through a cat’s claws, which is actually transmitted to a cat through fleas. Unneutered males are far more likely to fight than neutered cats. This is even true of multi-cat households, where unneutered males are more likely to fight with each other, as well as spray to mark their territory. Neutering indoor-only cats won’t eliminate fighting, but it should reduce the number of fights. Aside from the obvious sound of a cat fight, one of the main times you’re likely to hear a cat is when they want to be heard, like when they’re looking for food or a mate. The videos below include examples of cat mating sounds. You might also enjoy the other videos compiled by Meowsic (think “music” combined with “meow”), a research group that is studying the ways cats communicate with each other — and with us. Excessive vocalizing might be due to any of a variety of factors. If your cat is yowling at night, it might not be cause for immediate concern, but you shouldn’t ignore this behavior either. Here are some of the most likely reasons behind yowling. Important Note on Vocalizing: If your cat is vocalizing and straining while using the litter box, get them to the vet immediately! This could be a sign of urinary obstruction, which isn’t just painful and distressing to a cat, but will also be fatal if veterinary care isn’t sought promptly.